Watch carefully for my preferred bear evasion drill. I'm the guy in the polo. Whomever I'm hiking with is the guy with the ball. The guy in blue is the bear. It is hard to get the people you hike with to help you practice this technique. I set up a small drill that I tested for this purpose. A released basketball would roll downhill toward me and I would shoot as it approached. On rough gorund I felt that it might approximate the head of a bear charging toward the shooter, moving in all planes and directions. Hitting it was not easy and I was grateful that being mauled by a basketball is non-fatal. I got a lot of mileage out of one basketball (cheap at Goodwill) by not hitting it and patching it when I infrequently did. Humbling! There's nothing wrong with Critical Duty for a woods round...it may not be the best. I carry G20 loaded with Critical Duty in my truck when traveling, especially in the urban jungle of DFW area. Friends and I had an opportunity to perform barrier testing on a variety of vehicles with variety of 9mm and 10mm rounds, hollow point and hard cast. Because of this testing and our confidence in the bullet, I've carried Critical Duty in the woods in black bear territory. I wouldn't do so in Grizz country. If I'm camping in backwoods, I'll load up with Buffalo Bore Outdoorsman. Not really fair to armchair quarterback, but I reckon his best shot for CNS was the first shot he took (but he purposely chose to aim for body). I own a G20, but a Glock 40 in 10mm with the underworld extreme penetrators seems like a mini-carbine to me. It’s on my short list. Long time lurker since I usually don't know enough to comment. I have a G40 that fits in both my Recon and Heavy Recon kit bags with a crimson trace lightguard on it. The Recon is part of a running setup with the runner's harness and a tara, while the heavy recon lives on its own. Point being, at least for me the G40 actually carries fine while trail running in addition to having a reasonable draw stroke. Only other thing that might be interesting is that I currently run the 220 grain hardcast from Underwood. My chrono says that load actually meets the velocity printed on the box/online, and the velocity spread is small. That's with stock barrel and spring, and without any indication of a weak spring or excessive leading in the barrel I see no reason to change anything. Just wondering is the Xtreme Penetrator bullets change the conversation a bit. I am not into gimmicks, but this bullet seems like the real deal to me. I have tested it in .45 ACP and get really good penetration in clay and water jugs. I know it is not very scientific, but that's all I currently have. It seems that you can get enough penetration with a 10mm or a .45 to do the job. This allows folks to carry smaller handguns with more onboard capacity and less recoil than the typical field style revolvers. I am not knocking revolvers or other calibers, but thinking out loud. I still love my 69 and my Toklat. I have been currently shooting a Glock 30 with Underwood 200 grain penetrators and am very impressed with accuracy, penetration, and controllability. It shoots much softer than a 29 I owned a while back and penetrates better than the 10mm loads that were available back then. I liked the 29, but being left handed the recoil from the hotter loads caused my trigger finger to activate the slide stop. I have not had this problem with the 30 and the Underwood. I have put the 30 into my rotation and find myself carrying it quite often. I like it when I travel through the Western states as it works dual duty for CCW and while out in the woods. The one thing I know for sure it that there is no perfect solution. I think the best option is to get something you can shoot well, practice, and be smart in the field. ECVmat - I believe the Xtreme penetrators do change the conversation a little bit. They are not as heavy as hard cast but are much harder and create a greater wound channel. As far as penetration goes, they will not penetrate as much as a hard cast but beyond a certain point that doesn’t matter. In my 9mm I usually carry the XPs as the first three in my magazine then hard cast for the rest. B: shot placement is key, as you may only be able to get a few rounds on target depending on your skill level, draw quickness & carry method, accuracy, and ability to place followup shots. I'm currently carrying a Glock 20SF as my new woods gun with Underwood Extreme Penetrator and have full confidence in the round both for penetration and enough ft lbs. of muzzle energy to make anything I encounter during my travels drop, run away, or at least have second thoughts as they are chomping on me (grizzlies). If bear spray fails and a bunch of 10mm being slung it's way aren't stopping the threat then it's just my time to go I guess. 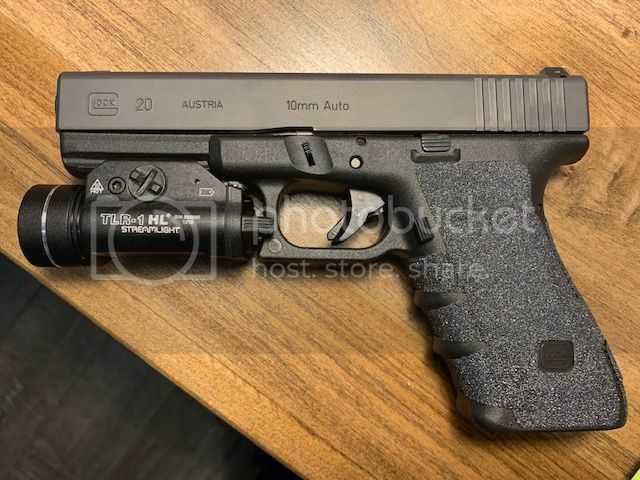 IMO the G20 and the G40 offer a great platform that provides decent firepower in a manageable size and weight while backpacking, and also allows you to carry more rounds than a wheel gun. Need to get a picture of the inside of my bag setup for carry. Have a velcro panel from MilSpec Monkey that works great as a little holster for the G20 with the weapon light and doesn't hang up the draw. Guys, I will start by saying that I have no experience with bears to speak of, so what I have to say is litttle more than the result of my own th8nking about bear encounters. That said, it seems to me that bear defense occurs at close range, often with a very fast approaching target, and the general consensus is that two to three shots will be the maximum one can get off before contact. Little thought seems to be given to what happens AFTER contact. I do not know if there is a good reason for this, or if the idea is just unpleasant and therefore avoided altogether. In my own consideration of the topic, it occurs to me that I will have limited opportunity to engage the animal, with a weapon of less than prodigious ability, and may end up in a wrestling match with an opponent much heavier and stronger than I am, who also has claws and teeth. It occurs to me that once the situation devolves to this point, I will wish to keep fighting if possible. Ever push an auto pistol into something and try to fire it? Try it sometime. My choice, for this reason, is a revolver, specifically a .357 or larger. I like the Redhawk in .44 with a 5.5 inch barrel. No mag to dump in a tussle, no slide to be pushed out of battery at contact distance, and if you can pull the trigger, it will fire. Yeah, it’s heavy. Yeah, it takes a lot of practice to be effective with it. And yeah, knowing it will work as long as I can, and packs decent punch to boot, is not a negative to me. Of course an 870 with hard cast slugs is also good, but not as easy to have onyou at all times.